Amatrol’s PLC Learning System – Siemens S7-1500 (87-IOSS715) provides an input/output simulator that allows learners to test PLC programs by providing manual input and output indicators that connect to a Siemens S7-1500 PLC input/output. This Siemens PLC program simulation system adds to Amatrol’s Mechatronics Learning System – Siemens S7-1500 (870-S715) and covers vital PLC training topics like PLC operation, programming, motor control, event sequencing, timer instructions, and counter instructions. The knowledge and skills covered by this PLC training system are extremely valuable for advanced manufacturing career opportunities like industrial maintenance technicians. In addition to the PLC simulator module, the PLC training system for the Siemens S7-1500 PLC includes interactive multimedia curriculum, an instructor’s guide, an installation guide, and a student reference guide. Amatrol’s world-class multimedia training courses provide real-world technical knowledge that covers theoretical concepts and reinforces hands-on skills. Within this PLC online eLearning curriculum, learners will study PLC communications and program execution, PLC program editing and documentation, seal-in program logic, safety interlocks, multiple actuator sequencing, on-delay and off -delay timers, and count up and count down instructions. This training system’s PLC Simulator Module features eight input devices – including four pushbuttons, two two-position selector switches, and one three-position selector switch (two inputs) – and eight output indicator lights. 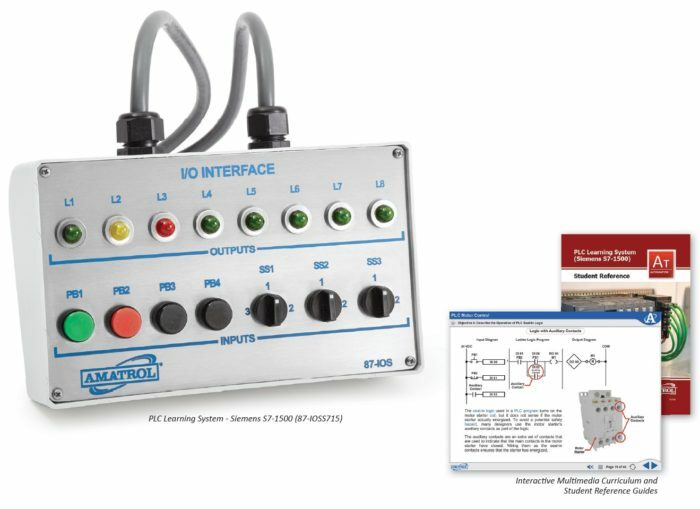 This PLC Simulator – along with the Mechatronics training system that includes a Siemens S7-1500 PLC (870-S715) – allows learners to test real-world PLC programs and applications through skills like designing a PLC program that controls two constant-speed electric motors, as well as entering and operating a PLC program for the following: an input instruction with an output address, a continuous-cycle actuator reciprocating program, a non-retentive off-delay PLC timer instruction, a PLC count up instruction, and more! Amatrol’s peerless interactive multimedia curriculum utilizes text with voiceovers, pictures, videos, stunning 3D animations, and interactive quizzes and reviews that engage learners in theoretical knowledge and concepts. Within this course, learners explore topics like: the basic components of a PLC, how to run and monitor a PLC program, the operation of internal output instructions, methods of stopping a PLC-controlled machine, the operation of a time-driven sequence, and much more. A sample copy of this course’s Student Reference Guide is included with the learning system. Sourced from the curriculum, the Student Reference Guide takes the entire series’ technical content contained in the learning objectives and combines them into one perfect-bound book. If you would like to inquire about purchasing additional Student Reference Guides for your program, contact your local Amatrol Representative for more information.